You put one foot in front of the other. And you keep going. That’s how you Walk a Labyrinth. That’s kind of what I told my sister as we approached the labyrinth off a desert nature trail in Tucson. A labyrinth is not a maze. It is an organized design, a circuitous winding path that leads to a center and back. Some say it’s like a map of your life’s journey. They say the labyrinth is a metaphor for the journey to the center of your deepest self and back out to the world, to know who you are. Or maybe it’s a path to meet with God. Whatever, labyrinths are supposed to help you find your way. People walk labyrinths for growth and for healing, to meditate, to clear and expand their focus, to reduce stress, to seek answers, find guidance, or to simply walk in wonder. You can walk a labyrinth in a group ritual or as a private meditation. It can bring rest, order, comfort, and harmony. Like meditating, it’s a process of letting go. You let go of trying to see what’s ahead and simply follow the path. In a labyrinth you can only go forward. There’s only one path, into the center and out again. Where you are is where you are meant to be. You cannot get lost in a labyrinth. The path is meandering but purposeful. You will arrive. And you will return. Eventually. There is only one choice to make: to enter the labyrinth or not. Many lives are more like mazes. A maze is designed to trick you, make you lose your way. There are choices, several paths to choose from. They branch off, twist, and turn. Blind alleys, dead-ends, potholes, unmarked trails that split unexpectedly, stream-crossings over thin ice, snakes suddenly slithering out of nowhere, rough rocky paths…. It was only one simple little choice: to enter or not. But I’m always complicating things. 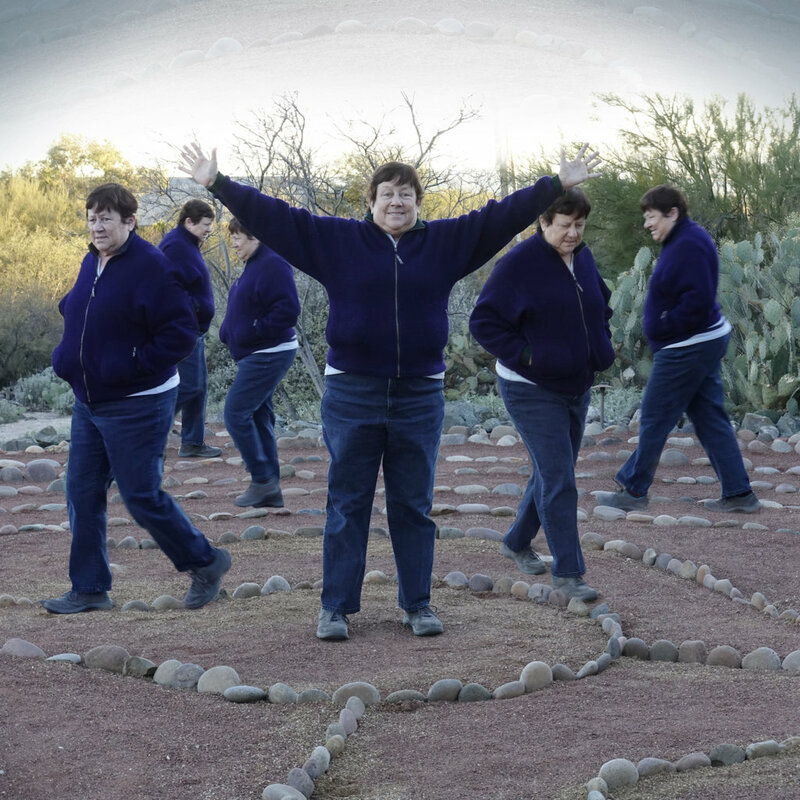 The labyrinth in the Tucson desert became a symbol for all the things that skirt the edges of my life in possibility: the desert beckoning me to venture into its mysterious harsh beauty, religion and spirituality, belief in an afterlife, belief in my own self and my potential. I did not walk the labyrinth. Instead, I stood outside the sacred space, taking pictures of my sister as she stepped serenely through the meandering trail, losing track of direction and the outside world, quieting her mind. One foot in front of the other. Smiling, mostly. Is your walk through life a labyrinth or a maze? This entry was posted in 2017 and tagged grief, healing, labyrinths and mazes, meditative walking, metaphor for life, one foot in front of the other, sacred space, walking a labyrinth on 2017/02/06 by Robin Botie. Nice and, as always, I love the photos. I was hooked on this sentence: “There is only one choice to make: to enter the labyrinth or not.” I hoped you’d hand your sister the camera and walk yourself. Next time maybe. Part of me (sometimes strong, sometimes faint) believes my life is a labyrinth. Sometimes I can see the clear path when I look back at the past. Much of the time, in day-to-day experience, life feels like a maze. That doesn’t surprise me since the ego is the one trying to see the patterns, and the ego is too small and only notices the most important parts much later. Do you know your comment section no longer has a box to check if I’d like to see your response to my comment? I’ve noticed it’s gone–and that I don’t get notifications of your responses anymore. It still has the subscribe to the newsletter box, so maybe the change is intentional. Oh, that ego. Mine’s a real pain in the neck, always looking back, looking for patterns and hidden meanings and all sorts of things rather than at what is simple and beautiful and right under my nose. You are so lucky to be able to sometimes see “the clear path.” Really rare occurrence for me. Maze upon maze, muddy water, fog, and more obliterating the path. And always obstacles and things to add to my to-do list, taking me away from any direction that may have seemed clear for a brief moment. Thanks for noticing the issue with my comment section. Sigh. Something else messing up a clear path. Will see to this pronto. Please let me know if you get this. Cheers! Sorry about the scare, Lynne. But it’s always good to periodically reconsider your focus anyway. Those scares are like alarm clocks – time to wake up and face reality. Time to change, maybe. For me, it usually takes a giant whack over my head to get my attention and refocus. Thank you for being out there. Beautiful post, Robin. I’ll need to think on the maze/labyrinth question a bit–seems like a great writing prompt for me. I’m leaning toward the labyrinth mostly although some days feel like a maze! Thanks, Monica. Thanks for the idea of using this as a prompt. I just started a writing group for survivors (of cancer, loss) and I wanted to have a few prompts up my sleeve just in case we get stuck someday. I hope your life finds a neat balance between the labyrinth and the maze. Could be pretty boring or harrowing having just one or the other. Robin, I’m afraid mine feels more like a maze than a labyrinth. And how did I end up here? Had a scare today that made me reconsider my focus–or lack of one. Thanks for your always-thoughtful inquiries.